A late one this, I’ve just added two more add-on adventures to the C&T Remastered Kickstarter, bringing the number of available adventures up to Five! I’ve also added a New Backer level of Sorcerer (£35) which gives you pdf+ at cost POD print copies of all five adventures + a hardcover rulebook. Briefly the new adventures are the sequels to UK S01 Blood of the Dragon and are part of the Spire’s Trilogy. This module takes the characters into the Stinking Marsh, a twisted weird land where nature has been befouled by powerful magic in ancient times. 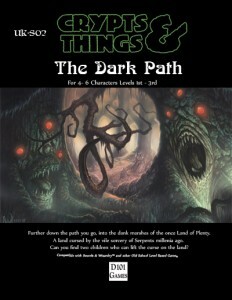 As well as a quick guide to the lands of the Stinking Marsh and its inhabitants, the module has two adventures. The Dark Path itself and Terror At Black Rock. Moving northwards from the Stinking Marsh the adventurers arrive in the bleak and devastated Bonefields, the site of an ancient holocaust where an entire civilisation was destroyed by magical warfare. 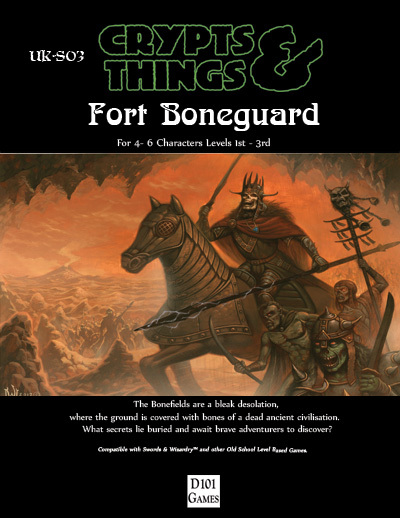 Unbelievably there is a small outpost , the Fort Boneguard of the title, hanging on despite constant attacks from the Bonefield’s undead inhabitants. This is a sandbox adventure, which suggests lots of plots and events but leaves the direction of play completely up to the players. Both are 75%-90% written and I’m aiming to land them in the 30 – 40 page count.